The Cement Barn cast many styles of Concrete Pedestals that are made to last! These products will not blow over like other outdoor pedestals on the market today. Cast out of quality concrete materials, they are designed to withstand the outdoor elements year round with proper care. Little to no maintenance is needed for the products. There are a few tips to keep your statuary clean year after year under General Maintenance. These items work great for several uses around the home or business, inside or outside. 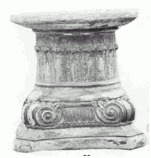 As shown in our catalog, you will see we offer a wide range of Concrete Pedestals that range from small to large. If you need a particular item that is not shown in our catalog, have a custom request, or any questions please feel free to Contact Us. Shipping our products will vary depending on the size and weight of the pedestal. See Shipping Information for details. ITEM # PED 105 - Four Leaf Pedestal - Natural: $25.00 - Painted: $35.00 - 12H"
Thanks for Shopping The Cement Barn! !